Deluge is a full-featured BitTorrent client for Linux, OS X, Unix and Windows. It has been designed using the client server model with a daemon process that handles all the bittorrent activity. The Deluge daemon is able to run on headless machines with the user-interfaces being able to connect remotely from any platform. Deluge features a rich plugin collection; in fact, most of Deluge's functionality is available in the form of plugins. As already mentioned , Deluge is available on a wide variety of platforms. For Ubuntu,Deluge is available in the universe repository. Cutting edge versions of Deluge is also available as a PPA via launchpad. Import the key from the PPA site. command-not-found is a special package in ubuntu that give you some extra information when you type a command that is not installed on the command line. It will look inside the package database and suggest a possible package to install so that the command can be run. command-not-found is installed automatically when you install ubuntu 9.04. For example , I got this when I typed jed. The command -not-found hook neatly searches the package database and suggest a possible package for installation. The upcoming release of Ubuntu ( 9.10 aka Karmic Koala) will have spell checking incorporated into the command -not-found feature . It will suggest a list of possible packages even if you make a spelling mistake. See the following screen shot of my Karmic Koala Alpha 3. Before learning how to start, stop, and disable services from the command line, it's important to understand Ubuntu's startup process and how Ubuntu determines which programs to run when it starts. Ubuntu uses System V style init scripts. The init scripts are located in a special directory named /etc/init.d. Even though there may be several init scripts present in /etc/init.d , not all of them are run at boot time. Ubuntu organizes which scripts to run for different circumstances into runlevels; most Linux systems have seven runlevels, ranging from 0 to 6. Runlevel 0 Halts the system. Runlevel 1 Sets up single-user mode. Runlevels 2-5 Set up different multi user modes. Although, typically, only one or two of these are used by a distribution. Runlevel 6 Reboots the system. Each runlevel has a directory that stores symlinks to certain init scripts in /etc/init.d, which are started when that runlevel is selected and stopped when it is exited. Ubuntu puts these symlinks under /etc/rc.d for example, all runlevel 2 scripts are located in /etc/rc2.d/. As you can see, this directory is full of symlinks that point to a script in the init.d directory. The letter at the beginning of each filename tells init when to execute this script. If the script begins with an S, then init starts the script when it goes through the runlevel. If the script begins with a K, then init stops (or kills) the script when it changes to a different runlevel. If the script begins with a D, then that script is disabled for the time being, and init ignores it. init runs the scripts in numerical order, so the numbers in each script let you know in which order they are to be run. This is useful to ensure that dependent services start after the service they are dependent on. 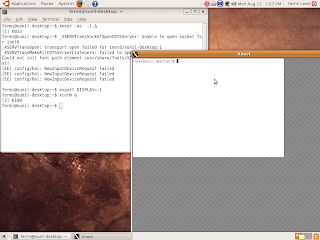 Ubuntu 9.04 uses upstart daemon to manage init scripts. The configuration files for upstart are located in /etc/event.d/ . ( On earlier systems, the start up was managed from /etc/inittab. You will not find this config file in new ubuntu releases.). When ubuntu boots up the default runlevel is determined by a small script in /etc/event.d/rc-default. Next, upstart loads any system scripts from a special system runlevel directory at /etc/rcS.d. These scripts load daemons and services that are vital to the boot process. Lastly, upstart runs any startup scripts for the default runlevel in alphabetical order. Scripts in /etc/rcS.d are run in runlevels 1 through 5, so you should generally leave them alone unless you know what you are doing. If you accidentally disable a crucial service, you may have to resort to a rescue disc to undo the mistake. You can also use init to halt or reboot a machine: just change to runlevel 0 and runlevel 6, respectively. To disable a script, you must know your default runlevel. On Ubuntu, the default runlevel is usually set to 2, but you may want to double-check your default runlevel before you start disabling services. You'll still need to stop the service as shown earlier if you want to shut it down right away, but renaming it will control whether it's started the next time you reboot (or change runlevels). Alternately, you can use the update-rc.d command to manipulate the starting /stopping of init scripts. As Ubuntu boots up , if you press Cntrl+alt+F8, you might notice text scrolling by, detailing all of the different things Ubuntu is doing. See the screen shot below. Apart from loading the kernel and starting the system, a number of services such as cron , gdm, cups etc are started at this time. If you have installed additional services on your system, such as a web server, they will also be started at boot. Sometimes, you may want to either stop or temporarily disable these services, and Ubuntu provides a number of ways to do this, both graphically and through the command line. You can also start it by typing the following command from a terminal. Press unlock and enter your password. The screen will change to the one given below. To disable a service, just deselect its checkbox and click Close. 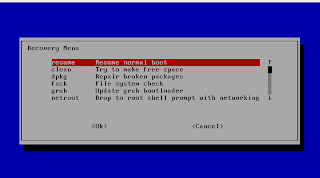 In Jaunty, this application supports changing only whether a service starts at boot. If you want to manually start, stop, or restart a service at a given point of time during your system usage, you need to refer to the command-line method. Today , I was playing with geexbox , a 20MB distro specifically built for converting your PC into a powerful multimedia centre. 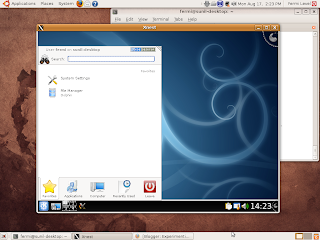 GeeXBoX is based on Debian, it works very well on any x86 PC. Addional images are available for 64 bit architectures and PowerPC. It recognizes a large number of hardware and supports almost any audio / video or images, as well as we can playback CDs, DVDs etc. Here are some screen shots . There are scripts to remaster the image with your own video/audio embeded with in the cd. I am yet to try them out. Any live Linux cd from standard Linux distros such a ubuntu , knoppix etc can be used. Open a terminal and use dmesg command to find out the hard disk. The ide hard disk are generally named as hda, hdb etc. SATA and SCSI disks are named sda sdb etc. My SATA hard disk is detected as below. The above hard disk has several partitions. sda2 , sda2 ,sda3 are primary partitions , sda4 is divided into several logical partitions. You have to find out where your root partitions is mounted. You can use cfdisk to find out the partitions. I am getting the following screen . Next unmount the partition and enjoy . Fcrackzip is a small utility that can become a handy tool when you want to look for lost zip password. To see the available options with fcrackzip , try the following. You can look for a password like this. fcrackzip supports brute force mode as well as dictionary mode. The man page has some more interesting options you can try. Shutter, according to its website is a feature full screen shot program. As a tech blogger experimenting with GNU/Linux and its derivatives, it offers me a number of handy features. In fact, I have replaced it as my default screen shot tool. When I press Print Screen on my keyboard,shutter pops up and does a nice job. 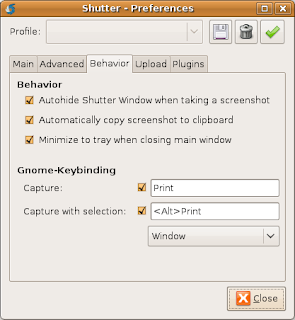 Making shutter the default screen shot tool on Ubuntu. configured  to  launch shutter as below. c) Click on behavior tab . See the screen shot below. d) Enable  Gnome Key binding by ticking the check boxes. I use gnome as my default desktop at home and at office. However, my machines have alternate desktop environment such as kde or xfce installed. I use it to test out features of these environment. The normal way to switch to a different desktop is to log out from the current desktop , select a new session from the gdm login window and login again. 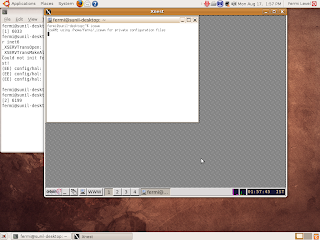 However, it is possible to open a new desktop environment in a virtual console using xnest nested xserver. Using Xnest to run another window manager. See the screen shot below. The :1 above indicates virtual X display numbered 1. You can also try other numbers. Now on the terminal , Type the following command. The above line exports the variable DISPLAY to :1. Now you can open a terminal in the Xnest window by typing xterm & in the terminal. See the screen shot below. Now try to start up a window manager such as icewm by typing icewm inside the xterm. I could start icewm and fluxbox and kde like this. However, trying to start gnome-session resulted in some error. I am yet to find out the reason . This method uses gdmflexiserver . gdmflexiserver is a part of gdm and it is used to run gdm session on demand on a virtual terminal. You can start it to give a gdm login prompt as below. You will get a new virtual X with a gdm login screen. See the picture below. At home I have, 2 machines, one running Ubuntu 9.04 (Jaunty) and the other running Ubuntu 8.04 (Hardy). The Hardy machine is used by my family members and I use Jaunty for my experiments. Some times, I would like to test some thing on Hardy also. But most of the times that machine is not free. I use ssh to login to the hardy box and use an ssh tunnel to export the GUI session back to my Jaunty box. The steps I took are detailed below. 4) Start a new session on Virtual Terminal 8 and launch xterm on it. 6) Now ssh to the Hardy box with tunneling. Give your credentials and login (The IP address above is that of my Hardy box, you can replace it with your user name and IP). You are now logged to Hardy. The GUI of any program launched on Hardy ( in this terminal) will be tunneled back to Jaunty via ssh. 7) Start a gnome session on Hardy by typing the following command in the xterm terminal. You can start other desktop sessions like kde or xfce , if they are installed. The DNS servers of my ISP is always behaving erratically. The DNS look up times are abysmally large and some times I get an address not found error while browsing. On ubuntu/debian systems the DNS servers are specified in /etc/resolv.conf. I tried to edit /etc/resolv.conf and put open dns servers as default DNS servers. But, my ISP supplies their DNS server address along with IP address for the system via DHCP. Every time my system renews its DHCP lease. my /etc/resolv.conf is also rewritten with their DNS address. My /etc/resolv.conf ( supplied by ISP) looks like this. There is a trick I used to make Open DNS servers as my default DNS server. Edit /etc/dhcp3/dhclient.conf and look for the line. Add the following line immediately below the above line. You can also put any other DNS servers. The new /etc/resolve.conf looks like this. DNS look up is made from open dns. LTSP was available as an install option in Ubuntu 8.04 and 8.10 from the alternate install CD . However I am unable to find it on the Jaunty CD. So, here is a quick how to on installing LTSP on ubuntu 9.04. This evening, I was looking at some microcontroller files and I needed a hex editor to tweak the machine code. 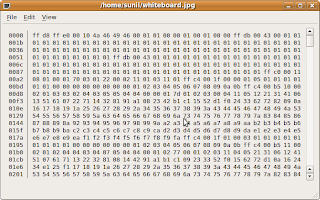 That led me to search for a good hex editor for my ubuntu desktop. I downloaded several programs (GUI as well as console) and poked around a bit with each. Here are five gui hex editors you can use on ubuntu 9.04. 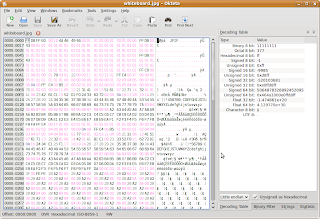 Ghex is hex editor for GNOME. 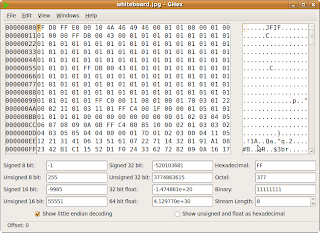 GHex allows the user to load data from any file, view and edit it in either hex or ascii. 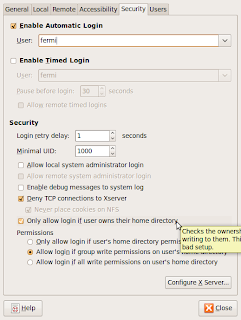 On ubuntu 9.04 , ghex is available in universe repository. The screen shot looks like below. Okteta is a KDE utility. 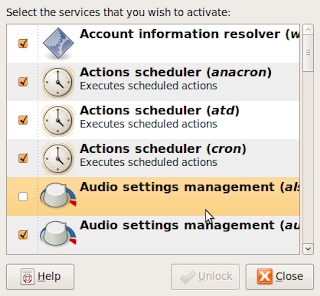 It is included in the new KDE 4.3 also. The data is displayed in two variants: as the numeric values of the bytes and as the characters assigned to the values. Values and characters can be shown either in two columns (the traditional display in hex editors) or in rows with the value on top of the character. Editing can be done both for the values and for the characters. Besides the usual editing capabilities Okteta also brings a small set of tools, like a table listing decodings into common simple data types, a table listing all possible bytes with its' character and value equivalents, a info view with a statistic, a checksum calculator and a filter tool. All modifications to the data loaded can be endlessly undone or redone. Octeta looks like this screen shot. 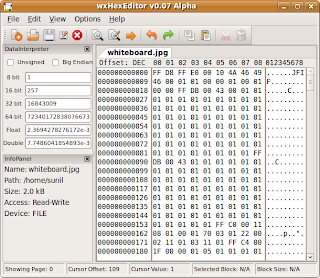 wxHexEditor is another Hex Editor useful for editing large files. Debian/Ubuntu package is not available now. However, you can download it in source or get a binary from here. It is still in alpha but looks very promising. 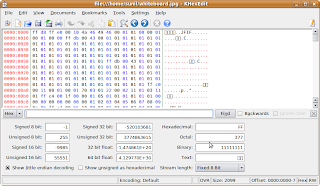 lfhex is an application for viewing and editing files in hex, octal, binary, or ascii text. The main strength of lfhex is it's ability to work with files much larger than system memory. Among the five editors mentioned above, ghex is my favorite as it is stable and userfriendly. If you are a Network Administrator some time you need to assign more than ONE ip address (second ipaddress) to your network card of Ubuntu machine. For this you need to edit the /etc/network/interfaces file by adding the following lines . See this how to from Shibu Varkala for details. 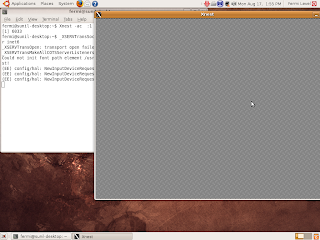 Today, I did a fresh installation of Ubuntu 9.04 inside virtual box. My original idea was to play with sudoers and sudo command. I edited /etc/sudoers and logged out. 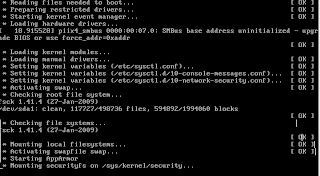 Next time I tried to sudo , I go some parse error in /etc/sudoers. I was stuck . I needed sudo for modifying the file. But sudo was preventing me because of the error. Then, I remembered about the recovery mode. Rebooted the machine and I pressed escape to get the standard grub screen as shown below. I selected drop to a root shell. It allowed me to enter root account with out a password. I fixed my /etc/sudoers and my problem was gone. Later I rebooted again and re-entered the recovery mode again to find out what capabilities it offers. 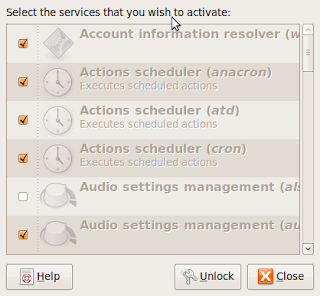 The recovery screen offers you the following menu entries on ubuntu 9.04 .
a) Try to make free space - this is useful if your machine is stuck for the want of free disk space. b) Dpkg - If you select this option you can repair broken packages. Very useful ,if the system is stuck after a package installation. 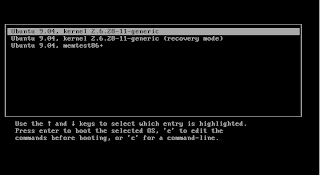 c) fsck - if the system is stuck with file system error you can try this option. 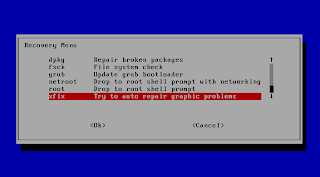 d) grub - You can update the grub boot loader from this option. e) netroot - Your TCP/IP network settings will be enabled and system will drop to a root shell. This option is useful if you are trouble shooting network related issues. f) root- Plain old root shell . Suitable for editing config files. I was installing Ubuntu at a friends computer today. He wanted to use the computer with out the login/password prompt as it was a home PC . I did the following steps to achieve this. Click on System ->Administration-Login Window. You will get a screen like this. Click on security and check the enable automatic login check box. Select the user name a automatic log in. The login preferences window offers several other options. For example, you can setup timed logins. This will allow you to login using user name and password with in a specified time.If you don't do this the user name specified will be automatically logged. Also, if you are enabling the system administrator account "root" , you can allow him to login to the GUI by ticking the appropriate option. Youtube is one of the most popular video sharing sites on Internet. There are several applications that let you download and store on your hard disk. Elltube is one such application which works both on Linux and windows. The screen shot of eltube is as below. Now you can download any youtube video by pasting the url of the video to the Elltube window. Locate the video you want to download and copy its URL. On my ubuntu desktop, when I copied the URL, it automatically appeared in ELtube. You can set the desired location to download the file and specify the out put format. Click on download and enjoy the video. Ubuntu desktop uses Gnome and its default desktop. You can add several interesting features to your contextual menus. ( You get a contextual menu when you right click on an object.). Let us see how we can add a simple script to the contextual menu. There is a special directory ( .gnome2/nautilus-scripts/ ) inside your home folder into which you can put your custom scripts. Any script you place in that location can be accessed by right-clicking on a file or window and selecting it from the Scripts sub menu. 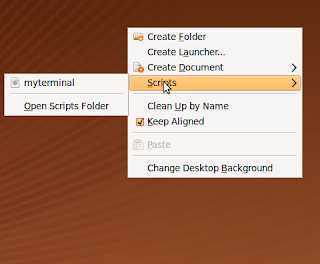 (The Scripts menu item will be visible only if you have some valid scripts installed. Now right click on the contextual menu. You should get it as below. When you execute a contextual menu script , a number of environment variables are passed to the script from nautilus. For example, if you select some files and then right click and select a script , the list of selected files will be passed to the script as an environment variable . You can use this variable inside the script for further processing. Some of the variables passed are. Here is a bare minimum example with which you can try out the use of environment variable. Suppose you want to open a terminal and change to a particular directory, you can put the following code in nautilus-scripts directory. ( There is no error checking). Now right click and select the script. Your terminal will open with the selected directory as the working directory. There are a number of nautilus scripts available on the internet. In the ubuntu 9.04 repository, the following script collections are available. You can also get lot of useful scripts from http://g-scripts.sourceforge.net/. 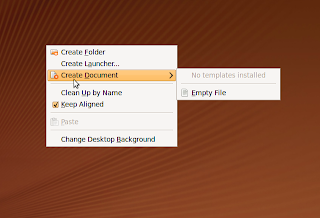 Ubuntu distribution uses nautilus as the default file manager. You can tweak nautilus to increase your productivity. Here is one hack which I discovered recently. 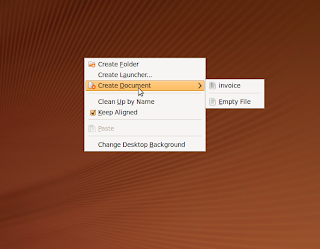 When you right click on the desktop or inside your file manager you get a menu as shown in the screen shot below. It allows you to create an empty document in your current location. The file created will be a text file. It is possible to create other kinds of file by a simple hack. Suppose you want to add an invoice template to the menu. 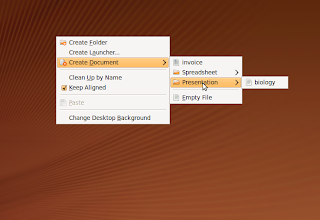 Create an invoice template file in your favourite application ,say in open office spread sheet. Let us call the file as invoice.odt. Now see the right click menu. It will look like the screen below. You can add as many templates as you like . Also, it is possible to group together templates by creating folders under ~/Templates directory. See the figure below. I have some groupings inside my template directory. If yuo are on Ubuntu open up a terminal and run yakuake from the terminal. It will prompt you with the following screen . Yakuake is prompting you to set a short cut key .The default is F12 . However on my Ubuntu desktop F12 is bound to search. So I clicked on the button and changed the default key to F10. Press ok and save the configuration. Now if you press your short cut key , yakuake terminal will pop up. If you press it again , it will hide itself. The appearance and behaviour of yakuake can be controlled. from its menus. You can access the menu by clicking on the down arrow symbol on the bottom right corner of yakuake window. Yakuake recognises almost all settings of konsole the KDE terminal. Yesterday , I wanted to send some web pages to a friend . I decided that I will make a PDF document and send the pdf. I looked around on internet for information about a pdf printer. Several sources pointed to cups-pdf. 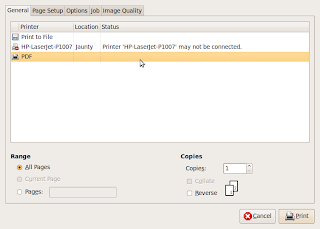 Under System->Administration ->printing a new entry came along with my HP 1007. See the screen shot below. I tried to print my webpage. I got the following screen from firefox. So, the pdfs are supposed to appear under PDF directory in my home folder. I looked for PDF directory. It was not there. I created it manually and tried printing again. So, if you are trying to make PDF documents with cups-pdf don't forget to create an output directory (named PDF ) in your home folder. See the screen shot below. 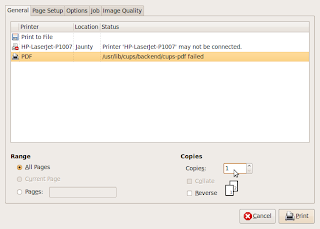 It shows the screen when printing to a working pdf printer. Ubuntu uses Gnome as its default desktop environment. Here are some keyboard short cuts that can make your life easy. Opens the Applications Menu . Displays the Run Application dialog. Takes a screenshot of the window that has focus. Switches to the workspace to the right of the current workspace. Switches to the workspace to the left of the current workspace. Minimizes all windows, and gives focus to the desktop. Starts the on line help browser, and displays appropriate online Help. Switches between windows. When you use these short cut keys, a list of windows that you can select is displayed. Release the keys to select a window. Switches between windows in reverse order. Release the keys to select a window. Opens the first menu on the left side of the menu bar. Opens the Window Menu . Also try ALT F10 and Cntl+F10 on the desktop.